Batteries for cell phones are a commodity and thus often quite cheap. The interesting part is that fake batteries will often cost the same as original ones and some dealers will swear by the fake Chinese NokLa phone in their hands that they are of course only selling “Original Nokia” products. Battery B really pissed us off as it was drained within a few hours (!). The hologram is just very simple yet it looks like an original battery (except for the hologram and the deeper golden contacts). There are no hints on Nokia’s website other than the hologram (they used to have a form to double-check that number on the holo but imho even those numbers were faked). 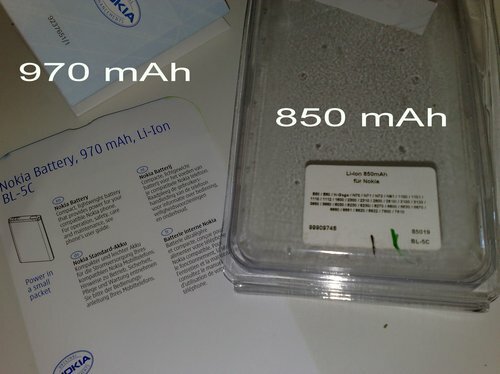 Battery B was bulk-ware, meaning that it came shipped in a plastic bag while battery C was in an original Nokia packaging with a proper invoice. A bit irritating that there are two different mAh readings – a sticker that says 850 mAh on the front and a printed 970 mAh on the back. On Nokia’s website it says 900 mAh for the BL-5C, but hey – Nokia’s website has never been that accurate on phone details. Nokia also published a product advisory on the BL-5C type some time ago – a successful battery type has been produced over 300 million times and is built by five different manufacturers. There are many, many dealers on eBay that sell BL-5C batteries for Nokia phones and I’d say that most of them are just fake ones. On the other hand, candidate number C was the cheapest, came in an original packaging and seems to perform like candidate A. Simbaya! There is just nothing in the world the Chinese won’t copy. Be it Montblanc-pens, notebooks or satellites. What surprises me more, is why everybody still loves to do business with them at the same time. Airbus just opened its first assembly-line in China; politicians and selfish business-men are full of praise about it, while everybody else is shaking their heads in disbelief. Fake cellphone-batteries that don’t work, but are manufactured (and disposed of) under environmentally doubtful conditions are a nuisance. You spend your money on ordering a battery, wait several days until it’s delivered to your home, then find out it is useless. However, there are some good sides to it. I recall my first mobile phone ever, which I had bought in 1994 in Germany. At that time, people still sneered at me for having it (“Schwanzverlängerung”, “Angeber”, “Neureich”) ;-) – two years later, everybody had one. My first one was an Alcatel HB200 – at that time modern. Without making fun of its features compared to nowadays’ technology: the fact was that its battery was almost 500 grams heavy, and lasted eight hours standby or one hour’s worth of conversation. At one time, the battery-charger broke, and a replacement cost me around 150 Deutsche Mark – fifteen years ago, that was 10% of my monthly salary. Fortunately, I never needed a new battery, because I got an entirely new cellphone after one year. But if I had, it would have cost around DM 270,- according to the dealer. By the way, I bought a new Nokia-battery charger in Taiwan as well while I was there, because I wanted one that fits the local electric sockets, instead of having to use an adapter. It cost me the equivalent of 2,80 Euros! It’s certainly not an original (though the difference is hard to tell), but it worked absolutely fine. The authentic Nokia-charger costs 16 Euros at home, and does nothing more than charging my cellphone battery either. Third party batteries from a official supplier can be so good like the original. But batteries from product pirates can be explosive. We had such a accident in the last weeks here in Germany!